Redesigning learning spaces is one of the hottest fields in education just now and I doubt if there are many institutions that are not planning some kind of makeover to their campus in the near future. The almost ubiquitous use of educational technology together with the transition from teacher-centered content delivery to active collaborative learning require a major rethink of how the institution uses its campus space and also how the digital campus can be realised. A couple of weeks ago I attended and spoke at a conference in London on this theme, Next Generation Learning Spaces. There were many inspiring projects in the programme, though of course only a small selection of what is taking place globally. Although my focus was on how we can redesign the digital spaces to facilitate collaboration and reduce feelings of distance (see my presentation slides), I would like to present some of the most interesting aspects of campus redesign that were presented. One speaker reminded us that today's designs are creating a legacy for the future and that we have to be careful not to let today's inspired design become tomorrow's headache. One legacy from the sixties and seventies that we are trying to deal with today is the problem of how to revive all the dead spaces around the campus: long corridors, concrete squares, dull entrance halls etc. These are spaces that people simply pass through as quickly as possible but could be exploited with a little imagination. One impressive initiative was the Creative Campus project at the University of Kent that studied how students used formal and informal spaces on campus. Students were invited to propose solutions to revive these dead spaces in innovative ways. 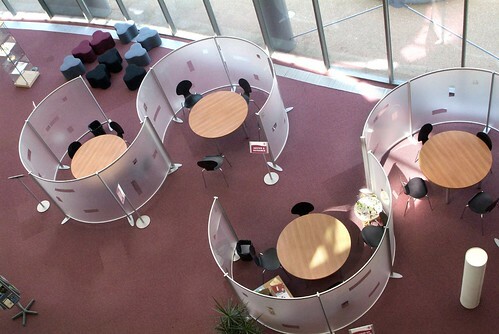 These solutions included transforming enclosed corridors into a cafe study area with colourful furnishings designed for group work and with a solid wall being replaced by glass panels that could be opened in the summer onto a patio area (see example). Drop-down screens make it possible to run semi-formal seminars. The furniture is multi-purpose; you can quickly build a stage with it or the tables can be turned on end to become poster boards for exhibitions of student work. Another solution was to make use of the parkland around the campus to include outdoor classrooms and a theatre and these can now be booked in the university system just like any other teaching space (see example). This was an excellent example of students making their mark on the campus and some of them went on to starting their own companies as a result. A presentation of how a large, dark and unused basement area at Edinburgh University has recently been transformed into a lively and popular learning space was of particular interest to me. As an Edinburgh student back in the seventies I remember that exact area in its most uninspiring period and can vouch for the fact that you didn't want to hang around there. See what it looks like now. 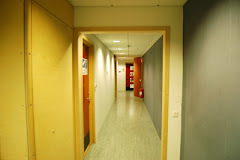 Another clear trend was the move towards multifunctionality, where all spaces can be used for many different activities rather than having dedicated lecture halls, classrooms or computer labs. This requires close collaboration between design teams, staff and students to ensure all needs are covered. At the University of Glasgow students and teachers are involved in the design process, testing new furniture, equipment and spaces at showcase events. They can try out the new designs, work in them, move the furniture around and generally get a feeling of what works and what doesn't work. The Manchester Engineering Campus Development (MECD) project at Manchester University mixes and integrates teaching and workshop spaces. A larger workshop area includes areas that can quickly be turned into a temporary teaching spaces using screens and flexible furniture. Teaching and practical work are thus integrated and students can move naturally from one to the other without changing rooms. They have also built a blended lecture theatre which adjoins a café and group rooms. For some lectures or events the screens could be rolled back allowing the people in the cafe to eavesdrop on to the event and the lecture hall also had a large window out to the street where passers-by might notice what was going on and be tempted to come inside. This would seem perfect for lunch seminars and allows serendipitous learning. The central entrance hall was also designed for easy conversion into a conference venue or a graduation ceremony where the stairs and balcony areas can be used as seating accommodation. At the Said Business School, University of Oxford, they are converting a derelict power station into a custom business school (see Osney Power Station Development). Here the idea is to think of campus spaces as film sets that can be transformed by moving in a variety of props and that all spaces can be used in a number of ways. By allowing this multifunctionality we may be ensuring that the legacy of today's developments does not become a headache for tomorrow. A further example of multifunctionality is the University of Sheffield's Diamond building. Here local schools were able to book the university facilities and meet faculty and there seems to be an increase in this sort of outreach with more integration between educational sectors. One speaker summed up the design process as making what you do fit the building and make the building fit what you do. the lack of use of innovative teaching practices reduces the demand for new and flexible rooms, which reinforces the traditional habits of teachers. Teachers need training and support to see how new types of learning spaces and digital media can offer a wider spectrum of teaching strategies and that the development of new learning spaces must go hand in hand with pedagogical development. In order to stimulate teaching and management staff, ALINA is developing a model and an accompanying tool. This tool could assist teachers in choosing the right learning space for their didactic method and vice-versa. Therefore the application will be able to provide manuals to a broad range of learning methods who will be linked to specific features available in certain learning spaces. For management staff, the tool can help to develop a consistent policy about learning spaces by collecting data on the needs of teachers and the available learning spaces. Finally I can warmly recommend the newly published UK HE Learning Space Toolkit that has been produced by UCISA (Universities and Colleges Information Systems Association) and several other UK associations. Here you can find plenty of inspiration and practical advice for all types of redesign projects. The overall message is clear; a shift from specialised spaces to generic, multifunctional and informal spaces. However changing the physical learning environment on campus is only one aspect of the problem, though it is the most noticeable one. A rapidly growing number of students are learning in off-campus spaces and how good is the digital campus that we offer them?. We need to link together many different learning spaces, organisations and communities, including workplaces and schools. That aspect gets very little investment compared to the physical spaces and it's time to include the digital campus in the overall discussion.